I wander lost through the desert mirage of her eyes. My throat so parched words no longer come forth. Light gleams from her eyes, their brightness more intense than the midday sun. My flesh boils wherever her gaze sets focus. Evil spirits peer through from doorways, though the light green shades painted upon her eyelids ward their shadows away. Her face hovers close enough that every warm breath she expels caresses my cheek. Her lips glisten with each passing circle of her tongue. Scenarios of her mouth descending upon my most intimate regions consume all my cognition. If only I could tell her how she infatuates me, she would certainly swoon into my arms. She would be bestowed with all the privileges of a queen. Temples would be raised in her honor, where priests would kneel in worship of her elegance. Servants would tend to her every whim and I would privately cater to her every intimate desire. If only I could tell her how much I loved her. If only I were not dead. Rudy’s rising voice distracts my captivation. In he walks wearing his usual blue jacket, and a badge bearing his likeness. For an instant I envision him as he was five years ago; hair more red than silver, a strong stance with good posture. That was before his wife died, before devotion to his job became the sole remnant sustaining his life. His gray hair appears a little thinner today, his pants a tad tighter. If I still had eyes in my sockets I would have rolled them. Snowfrue, really? My name is Sneferu. Is that so difficult to pronounce? I ruled my land for over 50 years, and that tablet over there clearly states that I built far more than the Red Pyramid. Just look at it, you illiterate. Peeking from behind his mother’s thigh, a curly-haired brat sticks his tongue out at me. How dare he disrespect my majesty with such a disgusting gesture! At one time I would have had both him and his parents lashed with reeds for such blasphemy. In my current state I am powerless to do anything but stare. If only I were able to wave a single finger at him, and send him screaming down the hall. Curiosity focuses their eyes upon her. Jealously smolders within my bandaged chest. My crooked neck, compressed from decay, leaves me no option to trail her. Rather I must gawk across the hall where ceramic jars filled with my organs are on display. The withered husk of my liver clings to the sides of a jar which has been cleanly cut in half for all to see. Every set of eyeballs glides my way, and every second of this public spectacle humiliates me for its own eternity. The objects gripped in their hands blind me with flashes of bright light. “Does anybody have any questions?” Lillian turns an ear their way. “Do you know how the mummy died?” The red-headed child steps forwarded, his pudgy jaw hanging in awe. My soul cringes again, even though I have heard the story recounted hundreds of times during my tenure on display. My sweet Lillian recounts the words of fools which are nothing more than a plague of inaccuracies. So, how did I actually die? How did I come to find myself on exhibit in a foreign land? Step closer, you pack of commoners, so Pharaoh may whisper the truth from his withered lips. “Wrappings and Rapture” was Allen’s contribution to an “invite only” H. P. Lovecraft themed anthology that expressly focused on mummies. 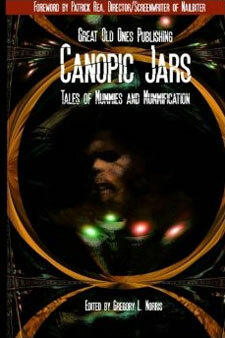 In addition to this story, there are 29 other amazing tales of mummies and mummification in Canopic Jars.